Damn!.... yes... very true! I completely forgot about Tremors! I love that movie... so I must now correct myself. I enjoyed him in 3 movies! A male doctor (Arnold Schwarzenegger) becomes pregnant after his associate (Danny DeVito) talks him into taking an experimental drug. Even though this is a (lets admit it) a stupid idea for a movie. It definitely has it's moments... and is really an entertaining movie. I think that is on the strengths of the stars. Danny DeVito and Arnold Schwarzenegger make a great team. The way Arnold portrayed a man being feminine and going through the physical and emotional symptoms of pregnancy definitely had a few laughs. I never been much of a Kevin Bacon fan... but this is one of the few that I do like him in. Mainly this one and Stir of Echoes (which is another one I haven't seen in a long time). Friday the 13th, Footloose, She's Having a Baby, Tremors, A Few Good Men, Sleepers, Wild Things, Stir of Echoes (much better than the sixth sense), Hollow Man and his short part in JFK. There are many others that I really want to watch someday, particullary Forty Deuce directed by Paul Morrissey a New York director that I really like. Friday the 13th, Footloose, She's Having a Baby, Tremors, A Few Good Men, Sleepers, Wild Things, Stir of Echoes (much better than the sixth sense), Hollow Man and his short part in JFK. Who are you and what have you done with Jimmy? And I'll thank you for keeping your opinions regarding Kevin Bacon's short part to yourself. As I said before I am not really a fan of his... these two movies is about all I liked with him that I have seen. I'm calling you out on this one! FOUL! SHENANIGANS! What about Tremors, Pete? What about Tremors? Detective Hoffman is seemingly the last person alive to carry on the Jigsaw legacy. But when his secret is threatened, he must go on the hunt to eliminate all loose ends. This is a movie I never seen before. I went into it a bit hesitantly as I heard that the movie series starts to go downhill from this point. Maybe that helped me to enjoy it more then some people do as I still loved every minute of this movie. Of course it could also be because (As I have said many times before) I am more forgiving of horror movies then most people are. The movie is filled with all sorts of torturous devices, blood and gore. It even had a familiar face in it this time. This one has Julie Benz (Angel, Buffy: The Vampire Slayer & Dexter). Though it did take me a few minutes to recognize her since I am not used to seeing her as a brunette. I will admit that I was a little more confused while watching this one (until the end reveal) then I have been with the past movies... but that could be because I was already tired when I decided to watch this movie. 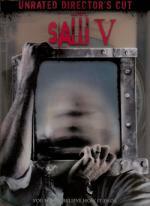 Saw V? A mere half point off being perfect? Surely not! Yeah... I always loved this series... I don't know why... just have. But I will tell you this much... I am not alone on this. I am part of several horror groups/sites... and this is a very popular series... even though I see many people seem to think it lost something with this newest one. But I had enjoyed it just as much as the others. But one odd thing I have found. As much as I have loved all 5 movies... for some reason I have never bothered to go back and watch any of them a second time for some reason. hmmmm.... weird. I can understand them being popular as there are few new releases like them for people who do enjoy that sort of thing, but it worries me how and why they get made. There's no art, no conscience, it's just traps after traps because it looks cool. Filmmakers have a duty to audiences I think; they tempt us in on the promise of something cool, but we should leave with something a little more substantial. The first Saw film did that very well (though I wasn't a huge fan). Actually I haven't seen part four or five, so I'm the worst sort of critic right now! I should watch it, but I have no intention to ever do so. Everything I've read suggests it's the same routine. If I saw one review that said they were finally trying something new and maybe even suggest there is some sort of plot, I might give them another chance.